So today's Dumb Fight Online will likely be about stand up comedians who got caught up in the #MeToo moment getting back on stage. Aziz Ansari, who got dragged through the mud for having a bad date, is doing some shows again. 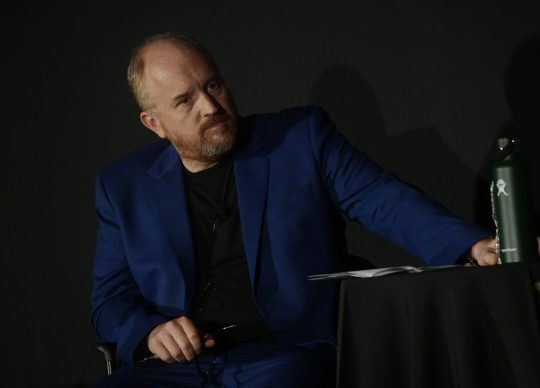 More #problematic is Louis C.K., public masturbator, who showed up at the Comedy Cellar and received a standing ovation before he even began his 15-minute set of new material. What is fascinating about the urge to purge—what has always interested and horrified me, in equal measures, about the online mob's efforts to get #problematic people #canceled—is that it's not enough to deny them your own money. It's not enough to live conscientiously, to practice your politics with your pocketbook. You have to force everyone else to live as you want to live too. Contra the tweet from Mark Harris above, there are ways to attempt a blacklist against the likes of C.K. : Twitter campaigns aimed at encouraging boycotts of comedy clubs that allow him to perform backed up by comedians refusing to cross a picket line, of sorts. But he's right, it'll be far more difficult. Instead of making this effort, however, I wonder if folks could maybe settle down for a moment and ask if, instead, they'd be better off just, I dunno, not going to see Louis C.K. If you don't want to see Louis C.K., you don't have to see Louis C.K.! If he shows up unannounced at a show and you're one of the folks who didn't hop to his feet to give him a standing ovation, you can leave the club. If you see he's going on tour, instead of attempting to mount a boycott of the venue maybe just accept that not everyone shares your values and move on with your life. It's a big country. There're a lot of people in it who don't think like you. The sooner you move on and accept that, the happier we'll all be. No one is forcing you to go see Louis C.K. work out his problems on stage. If you don't want to see him (or Ansari, or anyone else), then don't. But do the rest of us a courtesy and don't try to force us to adhere to your diktats.